During the Olympics you suddenly hear Human Biodiversity arguments in favor of More Immigration. After all, Americans are too genetically pathetic to medal in distance running, so we should just hire East African mercenaries to run for the USA the way Persian Gulf states do. Why Is the Country’s Most Dominant Distance Runner Not in Rio? Edward Cheserek came to the United States from Kenya with hopes of competing in the Olympics — if only he could become a citizen. This Cheserek is a Kenyan farmboy, who claims to be 22, who runs for the U. of Oregon and wins a lot of NCAA championships. His handlers tried to get him fast track citizenship, but it didn’t come through in time for the Olympics. After winning a prestigious 10,000-meter race, word of Cheserek’s talent passed to Father Richard Quinn, who ran an education charity in Nairobi. A filmmaker and jazz musician, Quinn had come to East Africa from New Jersey in the mid-’50s, founding Stadi za Maisha (“life skills” in Swahili) as a project to identify gifted children and even give some of them the opportunity to study abroad. Though Cheserek’s grades and grasp of English weren’t impressive, Quinn could sense he was special. Cheserek is a member of the Marakwet, a subgroup of the legendary Kalenjin, or “running tribe.” Since the 1960s, this tiny ethnic minority has come to dominate global distance running as perhaps no other ethnic group has dominated a sport. Anyone who has watched a recent major marathon has noticed the pack of spindly men and women striding way out in front. But the real awe lies in the arcana. Fewer than 20 American men have run 2:10 or faster in the marathon; but as David Epstein, author of “The Sports Gene,” pointed out to NPR, “There were 32 Kalenjin who did it in October of 2011.” Such a small and potent font of talent has inspired its own field of research, whose studies cover such diverse areas as evolutionary biology — which has lately focused on the development of long, slender limbs — and ethnography. One reason that goes unmentioned is that a Kenyan farmboy with poor grades in his native language and poor English isn’t exactly college scholarship material in an American classroom. Colleges that want top American basketball and football players like Dean Smith’s North Carolina set up African-American Studies programs to ease athletes through. But at least D’Sqhwan speaks English. This perhaps explains why the University of Oregon is so protective of the young runner. Our timed, one-hour meetings were arranged through Oregon staff members who waited outside, on separate occasions, to help the business major with his taxes and drive him the 10-odd blocks home. This style of hands-on management has made Cheserek an enigma to an already insular and suspicious track community. At races, Cheserek is often whisked away before talking to the press, and when he does talk, his words are couched in the first-person plural: “We always go one thing at a time.” “We” is an amalgamation of Oregon teammates and coaches, but also Hannon and his assistant coach, Chelule Ngetich, who have taken charge of Cheserek’s immigration paperwork. Many of these posts advanced the idea that Cheserek had lied about his age. … Bernard Lagat, a Kenyan-born American Olympian who has faced criticism over his own naturalization, likened this kind of antagonism to those tireless suspicions regarding President Obama’s birthplace. “It’s just because he’s affiliated with Africa,” he said. 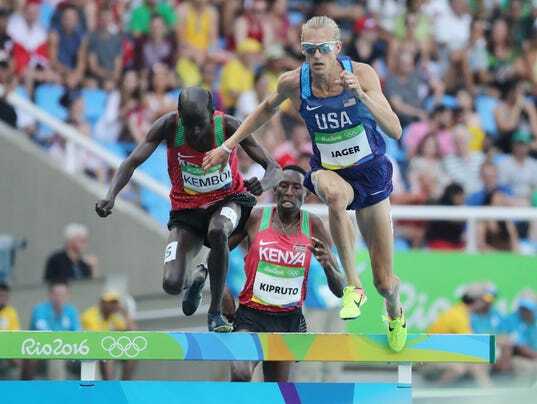 For example, American Evan Jager from Illinois broke the usual Kenyan monopoly on medals in the 3000 meter steeplechase with his silver medal. Emma Coburn won a bronze in the women’s steeplechase. Or how about Americans Jenny Simpson and Shannon Rowbury coming in 3rd and 4th in the women’s 1500? Clayton Murphy won a bronze in the 800m, admittedly not as much of a surprise, because that’s a distance where the most racial groups are competitive. That’s four white Americans born in America who have medaled in events usually dominated by East Africans. But for some reason, what they’ve accomplished can only be talked about in euphemistic terms.